Healing Myths, Healing Magic (eBook) - Amber-Allen Publishing, Inc. The myths we accept without question have a powerful, magically suggestive effect on the way we interpret our symptoms, the way we heal, and the quality of life we experience. Our stories, or myths, can create the magic of healing in our lives, or they can stop the magic completely. Dr. Epstein contends that unless we question the myths that control our lives, we will continue to make the same healing choices we have been conditioned to make, even if those choices are killing us. In this breakthrough book, Dr. Epstein divides the healing myths into four categories — Social, Biomedical, Religious, and New Age. 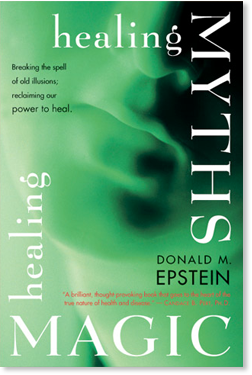 He exposes each myth individually, then suggests an alternative statement, or “Healing Magic,” to help us reclaim our body’s natural ability to heal. Myths have long exerted a powerful impact on the way we view health and healing. In centuries past, we were taught to believe that disease was caused by evil spirits. Typhus was believed to be caused by dark spirits or evil “vapors,” until it was discovered that the disease was spread by certain types of lice that thrive in unsanitary living conditions. Today, we are taught that disease is the result of viruses or faulty DNA. Although we experience an illness through our biology, it involves our psychology and a strong cultural component that is often overlooked. This idea meets resistance from the modern cultural story wherein we believe our biology to be largely removed from the culture. We have not considered that a significant part of our response to circumstances, including the manifestation and duration of symptoms and disease, is linked to the contextual model through which we view and experience the world. We cannot escape from our culture and our stories any more than we can take a walk outdoors and escape from nature. We can, however, choose to walk in the desert, swim in a tropical ocean, or observe the force of a storm. Our stories, like our experience of nature, are varied and changeable. If we had only experienced life in the desert, our perception of life and its possibilities would be vastly different from our perception of life on a tropical island. Our expectations for ourselves would be vastly different if we only knew Earth as a frozen tundra or grassy plain. We are inseparable from the larger context of the world we live in, the people we commune with, and the stories and perspectives of the culture of which we are a part. During the past millennium, the stories we have accepted as truth are responsible for tremendous misery not only in our personal lives, but in the world we have created around us. The sun and the moon, the tides, and our rivers are no longer treated as sacred. The history of our religious or tribal lineage imbedded within the memory of our bodies is no longer treated as sacred. If our story doesn’t support a sacred perspective of the natural world and our place within it, then how can the natural rhythms of our body be treated as sacred? Perhaps it is time to realize that what we once considered a “reality” may indeed be a myth. It is time to dispel our cherished myths, one by one, and implement new stories that can set us free from the dark spell we have been under. In over twenty years of teaching health care professionals and providing chiropractic care to thousands of individuals, I’ve come to realize that our capacity to heal is more often affected by society’s collective myths than by our personal circumstances, symptoms, or disease. Profound moments of healing on a physiological level are often limited by the stories we have about who we are, what it takes to heal, and how we see our place in the larger scheme of things. Our stories can create the magic of healing in our lives, or they can stop the magic completely. The purpose of Healing Myths, Healing Magic is to help you to become the storyteller of your own life; to recognize and empower those stories that help your life flourish, so you can experience a greater level of health and well being than any previous story has allowed. Your job, as a storyteller, is to act as a catalyst to bring forth a new story — to convert it from myth to “reality.” Of course, the path of the storyteller who dispels the illusions of current myths is often paved with rejection and abuse, because we consider our myths to be sacred. But dispelling old and useless myths is well worth the risks! This book explores four categories of myths that affect our health and well being: Social, Biomedical, Religious, and New Age. As you read the myths and reflect on their underlying assumptions, you can break through the spell imposed by these collective stories. You, as a storyteller, can put a new spin on these old stories, and replace each myth with your own healing magic. At the end of each myth is a brief paragraph designed to help you create a new story that promotes the healing process. This paragraph, or “healing magic,” is meant to be pondered, stated out loud, and repeated as often as necessary to dispel the healing myth. The healing magic offers new and exciting healing possibilities not only for ourselves, but for our loved ones. In the following pages, I urge you to look at the power of each myth and the hold it may have on you. Many myths commonly held today are ineffective or even dangerous when it comes to healing. You now have the opportunity to “awaken” as we discuss these myths and their influence on your health and well being. Since the power of our belief in a story may help heal us or kill us, let’s search for a story that assists in our healing and causes no harm.